This function block opens a port that is provided by connecting a "RS232 to USB" adapter. It supports a maximum of 25 interfaces (see table). 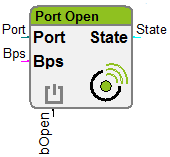 It is recommended to connect the input "bOpen" with an edge-triggered function block. At the input "Bps" the baud rate is given. The output "State" shows the current state. 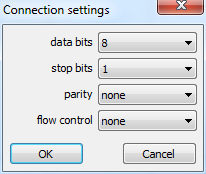 The parameterization of the interface parameters are set via the parameter dialog.